I have agreed to join in the programme of activities of the Institute for Interstellar Studies (I4IS) as a “Senior Scientist” with specific interests in Artificial Intelligence and remote vehicle operations. See I4IS senior researcher profile page. An initial trial virtual worlds collaboration facility is being provided at http://openvce.net/i4is by Austin Tate to I4IS for the technical groups during the Institute’s formation period. This involves an I-Room meeting space for collaboration in the virtual world Second Life (with an option to open a space in an open or closed region in OpenSim). It is designed for brain storming style meetings and as an operations centre. I-Rooms are used in the I-X/I-Room research on intelligent collaborative and task support environments at AIAI, School of Informatics, The University of Edinburgh. I4IS is producing a newsletter called “Principium” to communicate about its work to create what will be the equivalent of Starfleet Academy for the Earth. This entry was posted in Space and tagged I4IS. Bookmark the permalink. Grant, T.J. (1978). Project Daedalus: An Engineering Assessment. 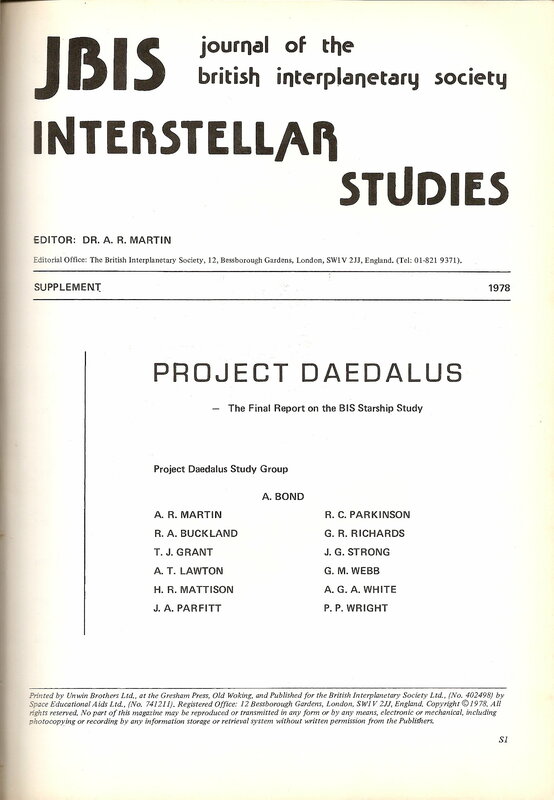 Journal of the British Interplanetary Society (JBIS), Interstellar Studies (“red cover”) issues, Special Supplement on Project Daedalus, 1978, S180-S191. Grant, T.J. (1978). Project Daedalus: The Need for On-Board Repair. Journal of the British Interplanetary Society (JBIS), Interstellar Studies (“red cover”) issues, Special Supplement on Project Daedalus, 1978, S172-S179. Grant, T.J. (1978). Project Daedalus: The Computers. Journal of the British Interplanetary Society (JBIS), Interstellar Studies (“red cover”) issues, Special Supplement on Project Daedalus (BIS’s feasibility study of an unmanned starship), 1978, S130-S142. Grant, T.J. (1981). In-Flight Maintenance: Part 1 – The Policy Choice. Journal of the British Interplanetary Society (JBIS), Interstellar Studies (“red cover”) issues, 34, 9, September 1981, 381-391. Grant, T.J. (1982). Estimation of Reliability and Maintainability Improvement Rates using the Duane Model. 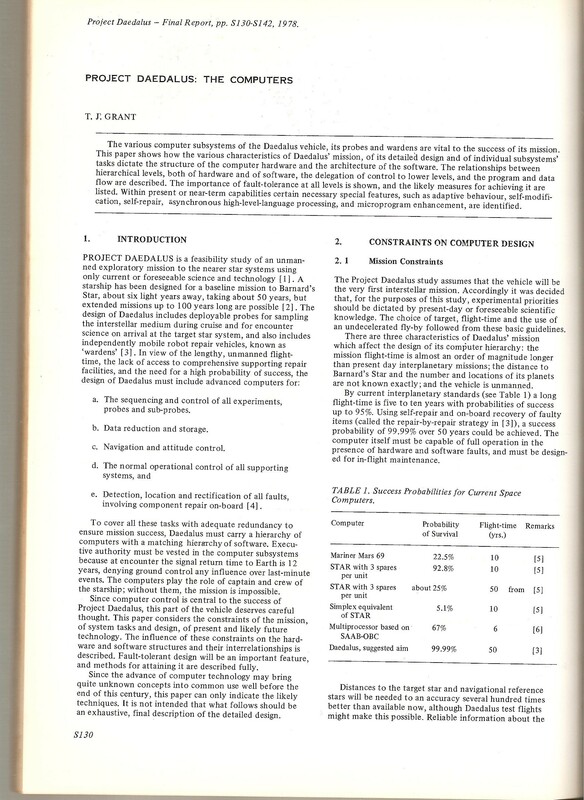 Journal of the British Interplanetary Society (JBIS), Interstellar Studies (“red cover”) issues, 35, 3, March 1982, 125-129. Grant, T.J. (1982). Daedalus Probe Requirements and Deployment Patterns as a Function of Reliability. Journal of the British Interplanetary Society (JBIS), Interstellar Studies (“red cover”) issues, 35, 5, May 1982, 226-234. Grant, T.J. (1984). The Population Stability of Isolated World Ships and World Ship Fleets. Journal of the British Interplanetary Society (JBIS), Interstellar Studies (“red cover”) issues, 37, 6, June 1984, 267-283. Due to restrictions on use of the name “Institute” in formal company names, when I4IS as set up as an incorporated organisation it adopted the name “Initiative for Interstellar Studies in 2014.